The average life of a compost facility is fairly short; ten years being a long time. Storing compost at a high-enough temperature to have it decompose properly (minimally 90 degrees) creates extremely humid conditions and gases. Burlington’s facility was at the end of its life cycle. However, instead of destroying the structure and starting over, the management group for the facility contracted with FoamCoat’s corrosion control system to salvage the facility. 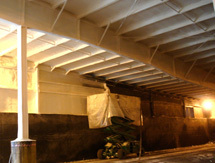 Some steel pearlings and Z-beams were damaged too badly and were replaced. The roof, ceilings, metal portions of the walls, and all structural steel were then covered with a special foam and corrosion resistant Stayflex coating. The condition of the roof, ceiling and walls was not good and required extensive prep work to get the surfaces ready for the various applications. The facility was needed so the management group wanted the job done as quickly as possible. With over 400,000 square feet to do, to accomplish this multiple crews were used, with the interior being done with a total of four spray crews; two operating at a time, with two shifts per day, six days a week. 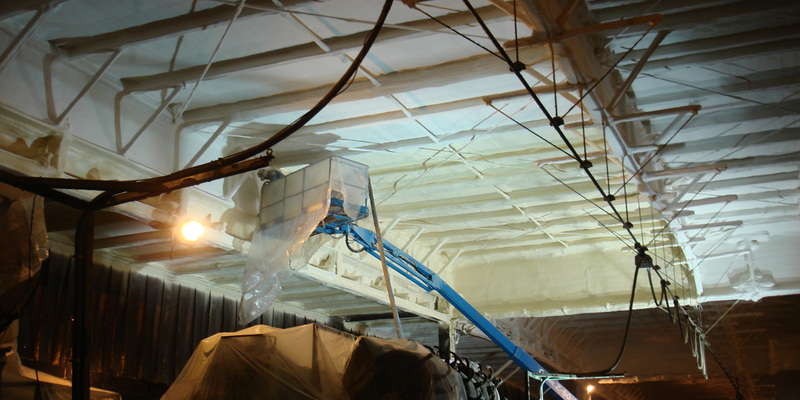 Due to a tight environment, for many spots a considerable amount of hand work was required to ensure the desired coverage of foam and coating. The job was completed in a timely fashion. All metal is now protected. The roof looks very good, but with acrylic coating normal wear will require some future maintenance. However, the interior is not expected to require maintenance. It is attractive and has very good reflectivity which will be helpful in a dimly-lit environment. The steel is completely encased with foam and coating and now has an indefinite life expectancy. (Testing of this type of application has shown no appreciable deterioration of steel after 15 years.) It can be hosed down without damaging the coating to keep the gains achieved in improved reflectivity and appearance. Note: Foamcoat is the country’s leading applicator of this corrosion protection system.